A charge notice will be completed for each occurrence and notification will be sent home to the parent/guardian through the student. Additionally, once the charge limit has been met the parent/guardian will be notified by the local school via phone call, letter, or email. 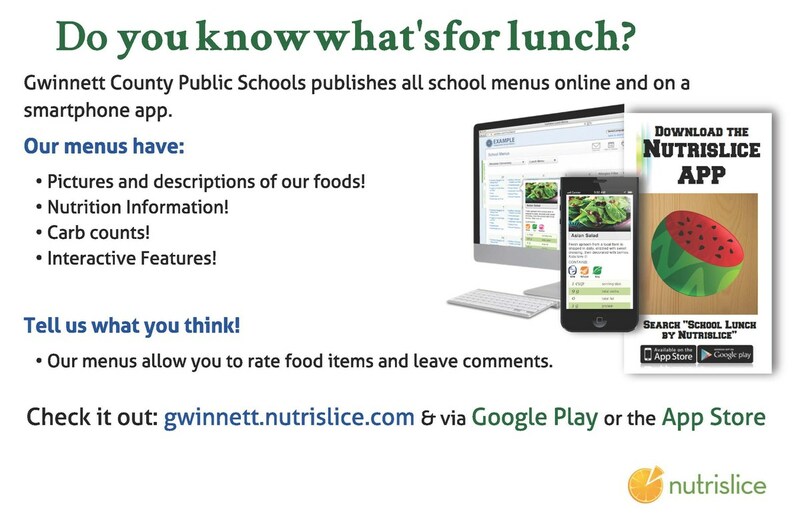 If you have any questions about your child’s meal charges, please contact the cafeteria manager at your child’s school. If you have any questions about a refund, please contact the SNP Central Office at (678) 301-6246. As part of the Universal Breakfast Pilot Program for SY2017/18, students now have the opportunity to enjoy a reimbursable breakfast at no charge. Each student is eligible for one reimbursable breakfast each day. A breakfast meal includes one breakfast entree, one juice or fruit, and/or milk. A la carte and supplemental items will be sold at the usual price. The School Nutrition staff looks forward to serving you a nutritious breakfast to jump start your day! Meal Prices for the SY 2017/18 are listed below for your reference. * These student prices are for the 2018-2019 school year. Students eat during their 4th, 5th or 6th period. Check with your student to see what time they are scheduled.